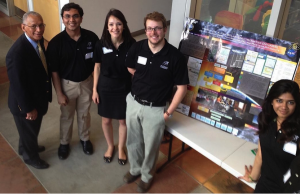 A bread loaf-sized satellite, designed and built by University of Colorado students, has been collecting data since its deployment from the International Space Station on May 16 and is providing observations of the sun at unprecedented wavelengths and resolution. The Miniature X-ray Solar Spectrometer (MinXSS)—a 30cm x 10cm x 10 cm, 3-unit satellite—is the first ever science CubeSat launched for NASA’s Science Mission Directorate and has already met its minimum mission science criteria for data and observations. MinXSS makes measurements of events erupting from the sun, called solar flares, which can disrupt Earth’s upper atmosphere and impede radio and GPS signals traveling through the region. Specifically, MinXSS is filling a gap that exists in solar observations by collecting data of the soft x-ray (SXR) band of spectral irradiance at resolutions not obtained previously. MinXSS is providing up to 100 times more spectral information in the SXR range than data provided by previous NASA missions, and scientists are using MinXSS data to calibrate the wide range of measurements taken over previous decades. The SXR data is important because it reveals information about the sun’s atmosphere (called the corona), its temperature, density, and chemical composition. By allowing scientists to trace how events like flares and other processes heat the surrounding material in the sun’s atmosphere, MinXSS is contributing information to a long-standing mystery about the sun: Why is the corona so much hotter than its surface? LASP Research Scientist James Mason was the lead student for the MinXSS project. The second flight model (MinXSS-2) has completed testing and is scheduled to be delivered in early December for a January 9, 2017 launch date. CubeSats are becoming a key component of our constellation of Earth- and sun-observing satellites. They are not only small, but can be built at a relatively low cost and can take narrowly-focused observations to answer critical science questions. Public and private organizations are providing more opportunities to launch small satellites by offering inexpensive access to launch services and by funding developmental programs. 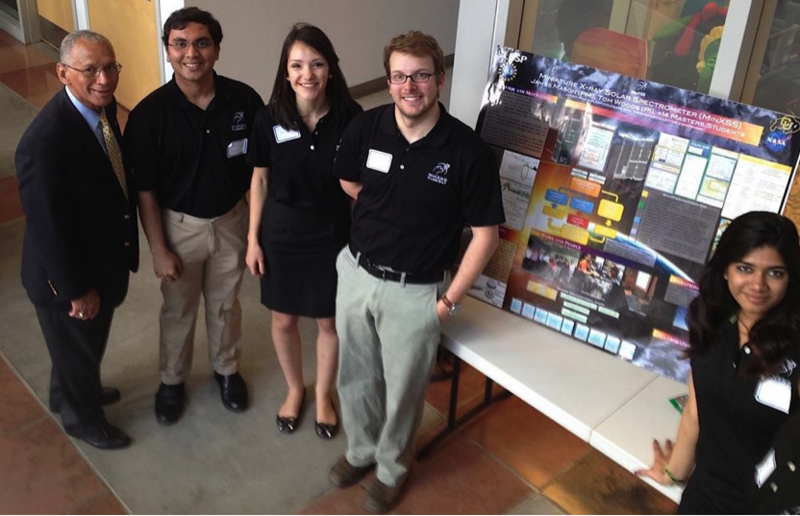 LASP professionals and faculty in the CU-Boulder Aerospace Engineering Sciences department serve as mentors for the students involved in the design and operation of MinXSS. The MinXSS team also includes scientists from NASA’s Goddard Space Flight Center, the Southwest Research Institute, and the National Center for Atmospheric Research. The NASA Headquarters Heliophysics Division manages CubeSat activities for the Science Mission Directorate.